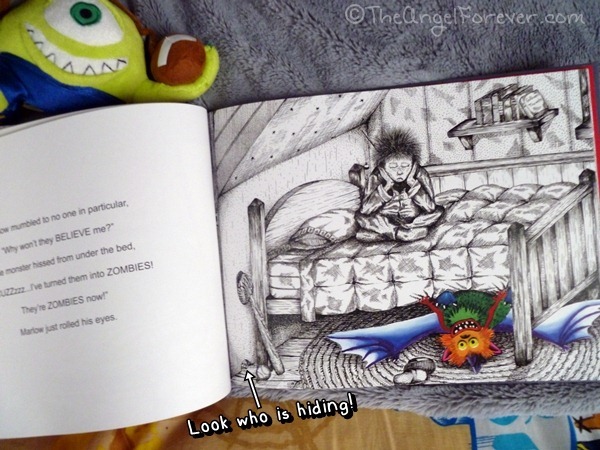 Did you ever have a monster under your bed, in your closest, or in another location in your room? Perhaps you did not, but maybe a child in your life has this fear. Author and illustrator Sharon Cramer’s granddaughter and a familiar Disney monster movie were the inspiration for her latest book Marlow and the Monster . 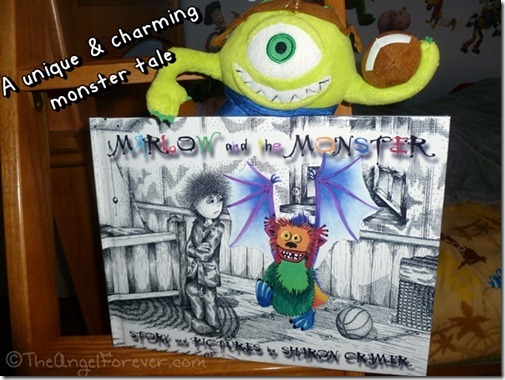 Marlow is a young boy who seems rather annoyed when a colorful monster keeps coming to his room. The monster keeps pestering Marlow and hides when he calls his mother to come help. Of course, nobody sees the monster who continues to bother Marlow. Eventually, Marlow figures out something to do that involves his little sister Sarah. She helps him to see the truth behind the monster and how he is not really that bad. JSL, 5, and I read Marlow and the Monster together and we both really enjoyed it. JSL immediately was intrigued with the very different style of illustrations from Cramer. Although black and white may seem quite simple, the level of detail in these magnificent drawings are beyond anything I have ever seen in a picture book. You can tell that love was poured into each and every page of this book. JSL was also fascinated with finding a sweet little friend within each picture. I know that we will now be checking out more of the books by Sharon Cramer, including her award-winning three-book series, Cougar Cub Tales. In addition to this, she is working on a Fantasy series called The Cerulean Star and just released her first full length novel, The Execution. Author and illustrator Sharon Cramer would like one lucky reader to have a very special copy of Marlow and the Monster for someone in your life. Please be sure to see the rules listed within the Rafflecopter widget and below. To enter, please follow the rules above within the comment section and Rafflecopter. Giveaway begins October 30, 2012 and ends November 14, 2012. You do not have to be a blogger to enter, but must leave a valid e-mail address for me to contact you for mailing address once the giveaway is over. You will have 48 hours to claim the prize. If there is no response, another winner will be selected. Open to US and Canada residents only. Disclosure: I received the autographed book complimentary of Sharon Cramer and Talking Bird Books in order to facilitate this review. No other compensation was received and all opinions are 100% my own. This giveaway is sponsored by Talking Bird Books who will fulfill the prize to the giveaway winner. Two Amazon Affiliate links are included in this post for the books in the giveaway. I will receive a percentage of money for the sale should you opt to buy the book through that link. My daughter and I read together all the time.